Welcome to the new year everybody! Hopefully everyone made it out OK because we have another great year of diecast to look forward to. I’ve been meaning to give this one a proper photoshoot but got kind of lazy towards the end of the year. Better late than never! This is Drift King’s custom 350Z, in 1/24 scale, by Jada. 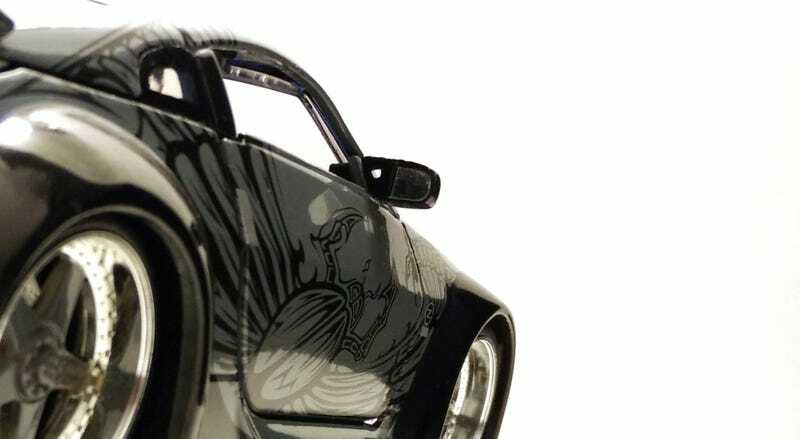 This car is from F&F: Tokyo Drift, which is actually my favorite movie of the whole series even though it doesn’t feature our two beloved main characters of the F&F franchise. It’s not just because of the cars; I personally find the whole Japanese setting, environment, and culture to be more interesting than the other regions of the world depicted in the other films. I’m not sure how many of you are actually into F&F as I am, so I can understand if these models don’t fit your tastes. Despite how ridiculous this thing looks, it’s actually pretty accurate in comparison to the movie vehicle. It has the same Veilside body kit and the wheels look very close to the real deal. Of course, the best part of this car is the crazy vinyl design that wraps throughout the body. I don’t know what exactly it is, but to me it looks like some beetle with wings. Upsloped chin! It doesn’t just affect Hot Wheels! Really the only thing I dislike about this model is that the wheels don’t fit the exaggerated fenders. Fix that and the Z looks much better.